In our last post on stopovers, we talked about how to use United’s free stopovers to see two places in Europe for the same amount of miles as a roundtrip. In this post, we’ll discuss how to visit two destinations on two continents using United stopovers. A stopover is when you stop at any point en route to or from your destination for more than 24 hours on an international flight, or more than four hours on a domestic flight. If you stay for less time than that, it’s a layover. 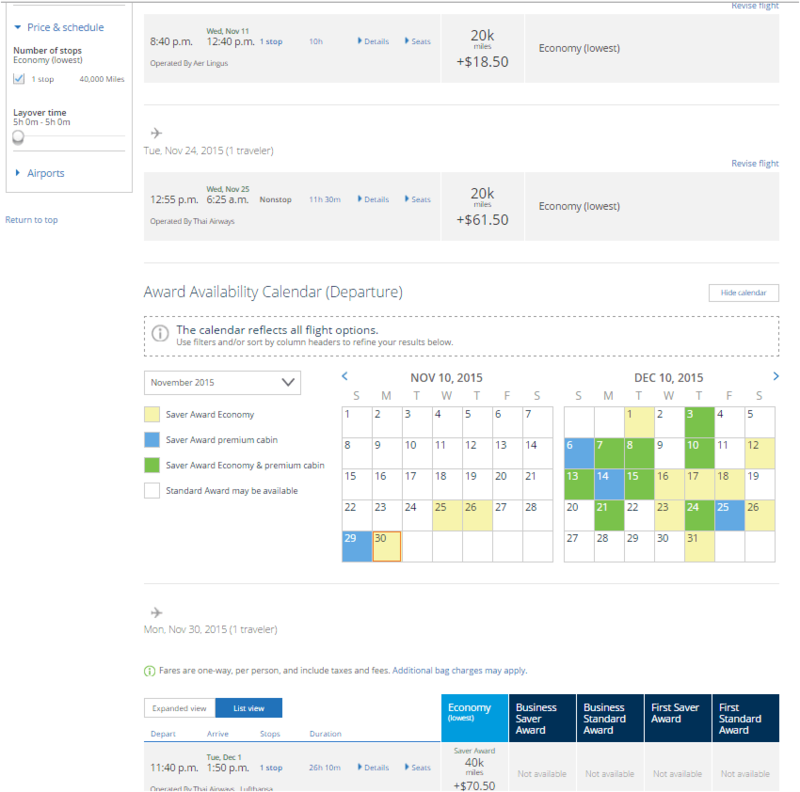 United’s frequent flyer program, MileagePlus, allows one free stopover per round-trip award ticket. You can use this policy to fly between the U.S. and two European cities, such as London and Rome. But what if you want to use a stopover to visit two destinations on two continents? 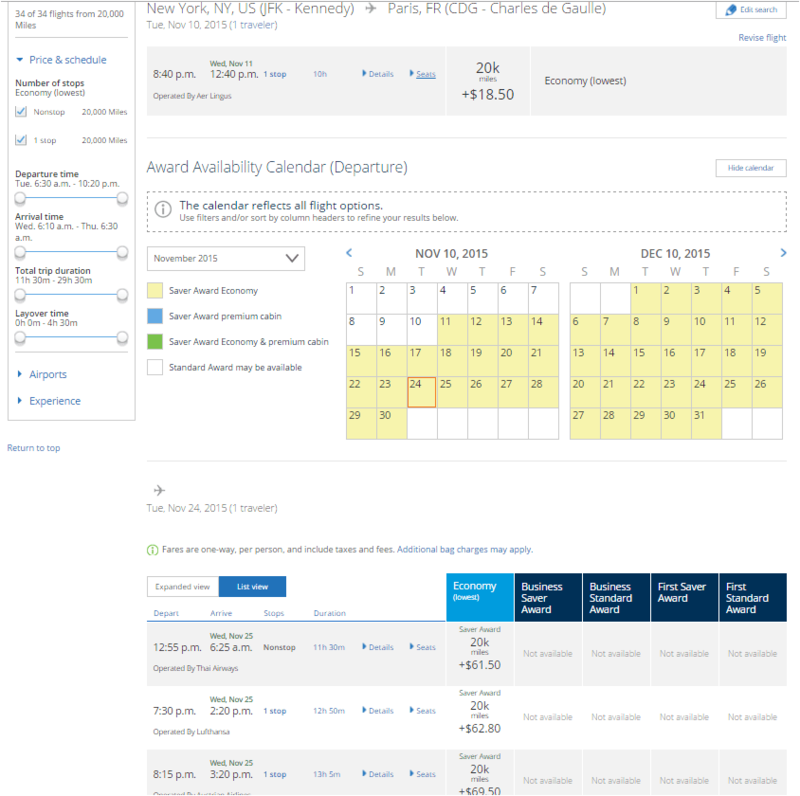 United allows you to do that as well, and sometimes it’s possible without paying extra miles. In the example below, we’ll look at how to fly to Thailand with a stop in Paris on the way there. On United, a round-trip flight between the U.S. and Bangkok without a stopover is 80,000 miles and $109 in taxes an fees. 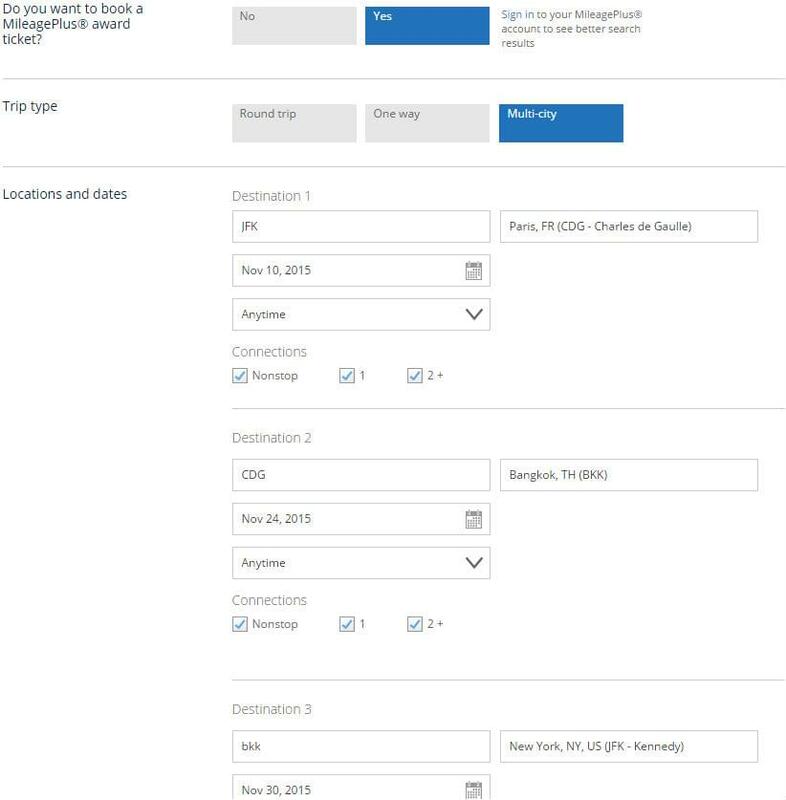 To search for a flight to Bangkok with a stopover in Paris, go to United’s website, select “yes” to book an award ticket, choose “multi-city” for the trip type and enter your flight information. 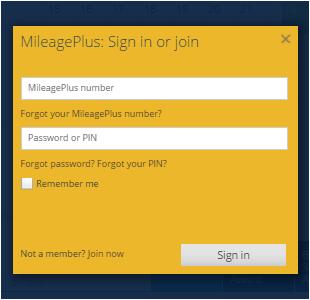 If you have elite status with United, you should log in to your MileagePlus account before searching. You’ll have access to more award seats. 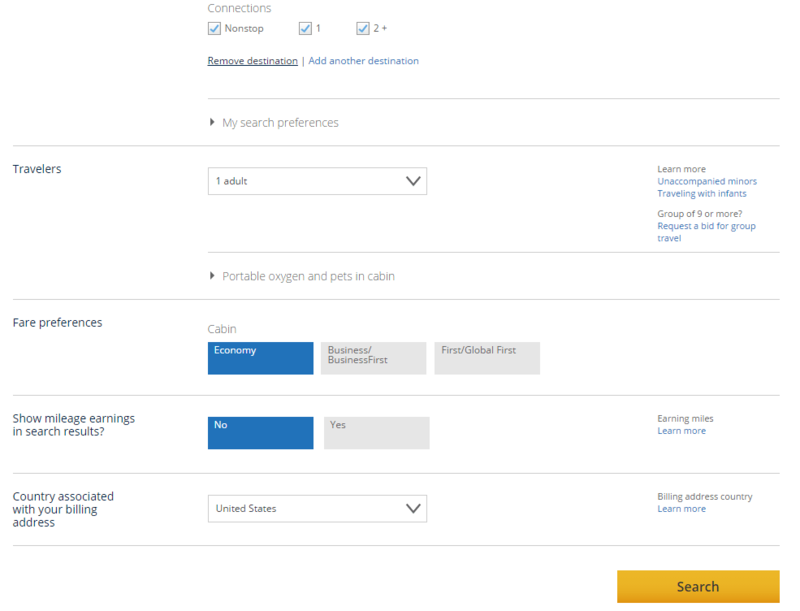 Fill in your flight information, and click “search” at the bottom of the page. 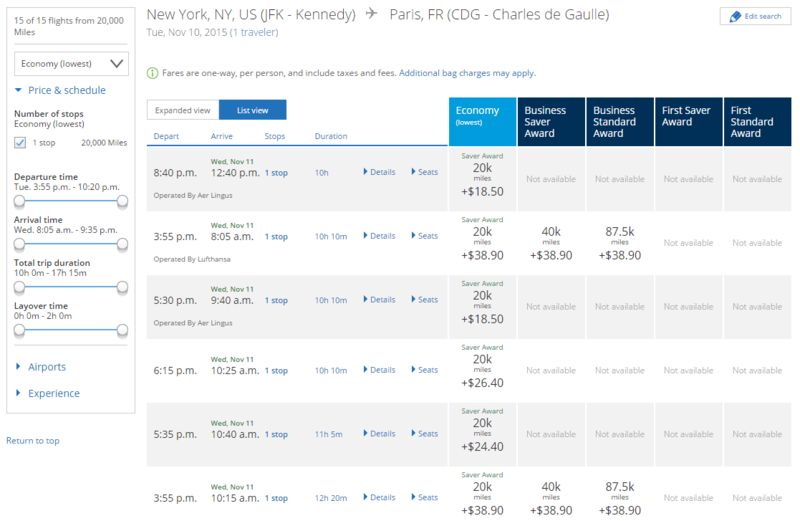 On the next page, pick the flight you want for the first leg between New York and Paris. Then choose the second flight from Paris to Bangkok. 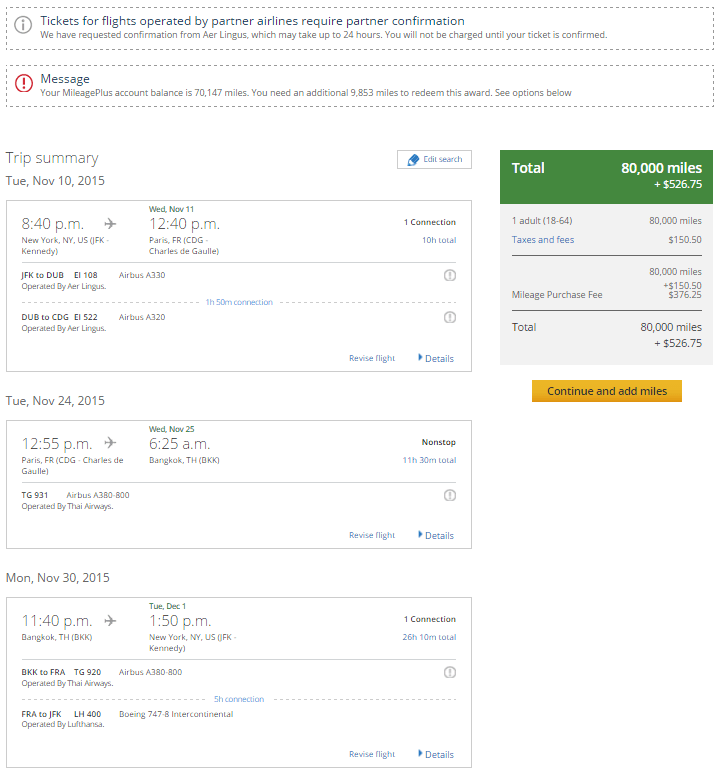 Pick a return flight from Bangkok to New York. If you haven’t already signed in, the next screen will prompt you to do so. At 80,000 miles, this itinerary costs the same as a direct flight to Bangkok. The total cash cost would be $150.50 if there were enough miles in the account, making the total extra cost of stopping in Paris only $41. That’s not much to visit Paris, and a lot less than a ticket between New York and Paris would cost separately. If you don’t have enough miles in your MileagePlus account, you can buy miles to make up the difference. That’s the reason for the sizable cash cost for this award ticket. Though it’s generally not a good idea to buy miles, because of their price, it can be a good option if you only need to top up your account with a few thousand miles. One final note: When you’re building an itinerary, the cost in miles will not change if your destinations remain the same. The taxes and fees might, though, depending on the specific routes you’re flying and the airports you travel through.